This review proves that Gates Way is a binary options scam that has nothing to do with Bill Gates. GatesWay allegedly is a binary options trading software developed by a team that was hired by Bill Gates, the founder of Microsoft. Gates supposedly wanted to let ordinary people earn money in trading. The truth is that GatesWay is a very insolent scam, because it abuses not only binary options, but also Bill Gate’s identity. The TED Talks video with Gates that you can see on the GatesWay website is real, Gates really spoke at TED. But his original speak was about viruses and scammers replaced his voice with somebody else who speaks about a binary options software. They also edited the video and put the GatesWay logo on the background instead of the original. Look at our picture to see the comparison with the original. Except for Gates, all the people you can see in the Gates Way video are paid actors. Including those who share their experience with this trading system. The testimonials are fake. Look at the proof on our picture, this guy is a Fiverr actor who will endorse anything for just five dollars! And finally we tested the Gatesway software. It of course has absolutely nothing to do with Microsoft. This program was created by scammers and is used by scammers only. 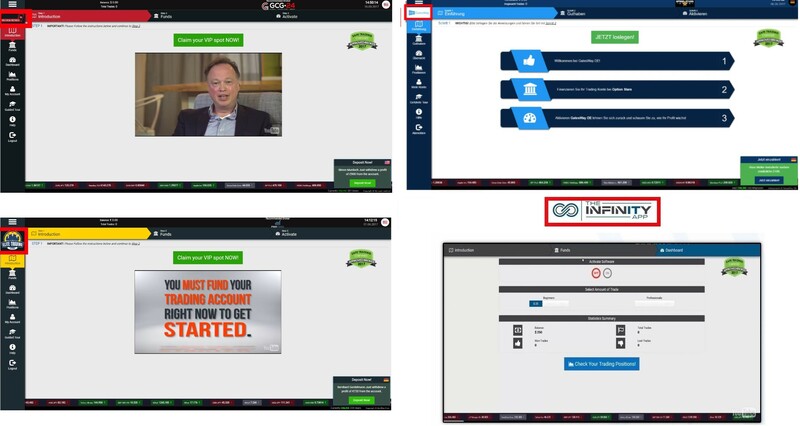 There is a lot of binary options scams based on this same software, look at some examples on our picture, like Infinity App, Elite Trading Club and My Cash Method. We get regular feedback about this software from real users and they all confirm that it is losing money in real trading! So what is the true purpose of Gates Way? To earn money to scammers who run it. They will do that by making you deposit money with their affiliated and unregulated binary options broker. They won’t let you use their software until you deposit at least $250 with their broker to earn them money. If you do it, GatesWay will then lose your deposit in trading. That’s how it ends. GatesWay is an insolent scam that abuses binary options to make you lose money with a worthless software. Stay away from it! You can make money in trading, but first you have to learn to trade and build yourself a profitable strategy. No software will do that for you. You can try it on a free demo account with a regulated broker. Don’t start trading with real money until you have your profitable strategy ready.